You’ve already met our staff member, Beven Ndemera, our fellow tree loving Assistant Nursery Manager from Zimbabwe. But we have so many more talented and passionate members of our team working tirelessly on the Just Trees farm who deserve some time in the spotlight. This is why we’d like to introduce you to Fatchu, another member of our Just Trees community and an intrinsic part of our team. 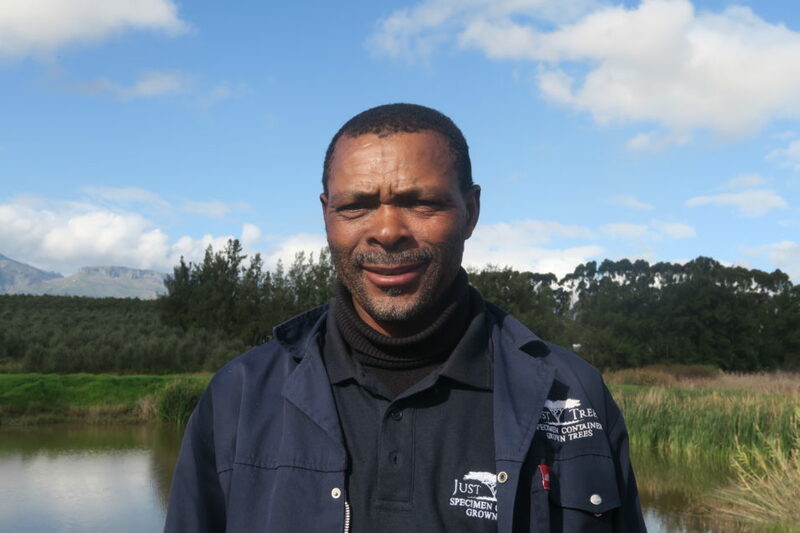 Fatchu arrived in Paarl in 2006 from his home in the Eastern Cape on the search for new job opportunities. Like Beven before him, a friend and a current employee at Just Trees had told him about a great opportunity that had opened up at the nursery. Fatchu excelled and displayed his impressive work ethic on the farm. He soon became an essential piece of the Just Trees puzzle and was promoted to heading up the pruning team. This is a role he has filled for 12 years! Twelve years after joining the Just Trees family, 51 year-old Fatchu, continues to inspire and lead the pruning team as they meticulously comb through all of the planted trees, ensuring that they are all kept healthy by removing dead branches and keeping their shape as tidy as possible. He is also responsible for delegating tasks to each of his team members in order to ensure that their combined tasks are completed on time and that the Just Trees clients can have their pick of each uniquely beautiful tree species. To Fatchu, Treeification has to do with the knowledge of the importance of trees. Biologically, psychologically and spiritually, there are many benefits to having trees in our environment. Trees create oxygen which helps us breathe, they store carbon, stabilise the soil and give life to the world’s wildlife but they do even more than that. Trees bring beauty into urban environments that impacts the day to day life of human beings. In Fatchu’s case, he has a big beautiful tree outside of his home that provides shade as well as protection from the wind. Where he grew up in the Eastern Cape, trees were used to build enclosures for cattle as well as to protect them from the wind and the heat of the sun on scorching days. Fatchu joined Just Trees when there were nothing but small trees lining the area, but today he can look back and see just how much those trees have grown and how much he has grown with them. We look forward to having him on our team for many more years to come as he continues to ensure the long lasting lives of these magnificent species.